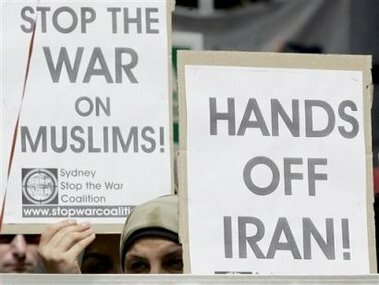 In Australia… Saturday’s protest of 500 people was small compared to the mass demonstrations that swept across the country in the buildup to the invasion — the largest Australia had seen since joining U.S. forces in the Vietnam War. In London… Authorities shut down streets in the heart of London’s shopping and theater district for the demonstration, which organizers had predicted would attract up to 100,000 people, but police estimated the crowd was about 15,000 people. 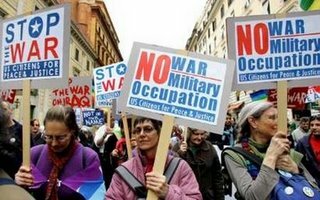 In Tokyo… About 2,000 people rallied in a downtown park, carrying signs saying “Stop the Occupation” as they listened to a series of anti-war speeches. In Sweden… about 1,000 demonstrators gathered for a rally in Stockholm before a march to the U.S. Embassy. In Berlin… About 700 protesters marched peacefully through an inner-city district during a rally, police said. In Austria… protesters marching through Vienna — about 200 by police estimates — chanted “Freedom, freedom for Iraq and Palestine,” as they made their way to the U.S. embassy. 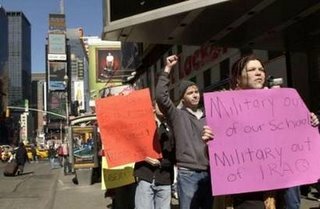 The War Resisters League is planning a protest today in New York City. Paul Haggis, the Canadian director of “Crash”, this year’s Oscar winner for best picture, will lead a protest in Hollywood this weekend against the war in Iraq. W.C. Varones caught the San Francisco protest and has some “interesting” pictures. Oh Boy! Zombie, has incredible pictures from the San Francisco social gathering.